The focus of the Buhari administration in the next four years will be to address, among other things, the deficiencies in the quality of human resources caused by poor education and healthcare, according to Vice President Yemi Osinbajo, SAN. Prof Osinbajo spoke today at the University of Lagos where he delivered the Convocation Lecture ahead of the university's 50th anniversary. According to him, "I may begin by affirming the belief of the Buhari administration that Nigeria's prosperity means a decent existence for all. Second, that prosperity so defined will be attained if we are able to address the issues of extreme poverty, productivity, corruption, the rule of law and the deficiencies in the quality of human resources caused by poor education and healthcare." He said: "We must have a robust enough healthcare system that ensures that the average person is in good health, an educational system that guarantees education capable of preparing children for the opportunities and challenges of a knowledge economy." 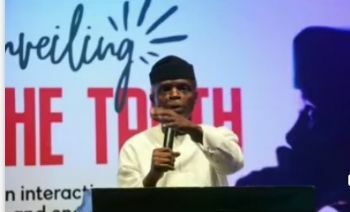 Continuing, the Vice President said, "in planning the path to prosperity we also took into account the age-old weaknesses of the Nigerian economy and the illusion of prosperity that frequently distorts our understanding of the actual fragility of our economy". "Others include; adopting a new approach to resourcing healthcare; putting in place a social investment programme that deals with issues of extreme poverty and unemployment. Our Economic Recovery and Growth Plan effectively addressed these issues", the Vice President added. On the progress made so far, Prof. Osinbajo said the Buhari administration believed that "creating an environment for productivity investment in hard and soft infrastructure is crucial". According to him, "If we stick to our agenda in the next two years we will see the most significant improvements, in our power sector. "Industrial Infrastructure is a major component of our economic transformation plan. Project MINE (Made in Nigeria for Export) is the major plank of our industrial policy. The idea is to build Special Economic Zones which accommodate industries for local manufacture of goods for which Nigeria has a comparative advantage. These include cotton, garments, Ieatherware " etc. Shortly before delivering the Convocation Iecture, Prof. Osinbajo unveiled the Mascot for the 26th NUGA games; commissioned some projects executed by the University.